In this post I will complete the story (as far as I know it thus far) of the descendants of Marx and Sarah (Koppel) Seligmann. Marx, the younger brother of my three-times great-grandfather, came to the US with his second wife Sarah in 1849 and had four children: Sigmund, Jacob, Charlotte, and Mary. I have already written about the first three. As I posted before, the youngest child of Marx and Sarah Seligmann, their daughter Mary, was the first to marry. She and her husband Oscar Kornfeld, a cigar maker, married in 1873 and by 1882 had four children: Marx (later Max) (1874), Rose (1877), Carrie (1879), and Lillian (1882). In 1900 Mary, Oscar, and their three daughters were living at 1883 Madison Avenue. Their son Max had already married Emma Pisko that year prior to the 1900 census. Two of their daughters also married during 1900. On March 22, 1900, Carrie Kornfeld married Berthold Weiss. He was the son of Sigmund Weiss and Rose Hecht, who were Hungarian immigrants. Sigmund was a woodturner, according to the 1900 census, and Berthold was a hosiery salesman. On December 23, 1900, Rose Kornfeld married Joseph Cohn. Joseph was the son of Philip and Adele Cohen, German immigrants. His father was a baker. Joseph was born in New York in 1876. In 1900, before marrying Rose, he had been living with his parents and brother and working as a printer. New York, Marriages, 1686-1980,” , FamilySearch (https://familysearch.org/ark:/61903/1:1:F6HY-Z96 : accessed 8 August 2015), Joseph Cohn and Rose Cornfeld, 23 Dec 1900; citing reference ; FHL microfilm 1,570,443. Thus, within one year, three of the four children of Mary and Oscar Kornfeld had married. Their youngest child, Lillian, married two years later. She married Emil Nardin on May 4, 1902. 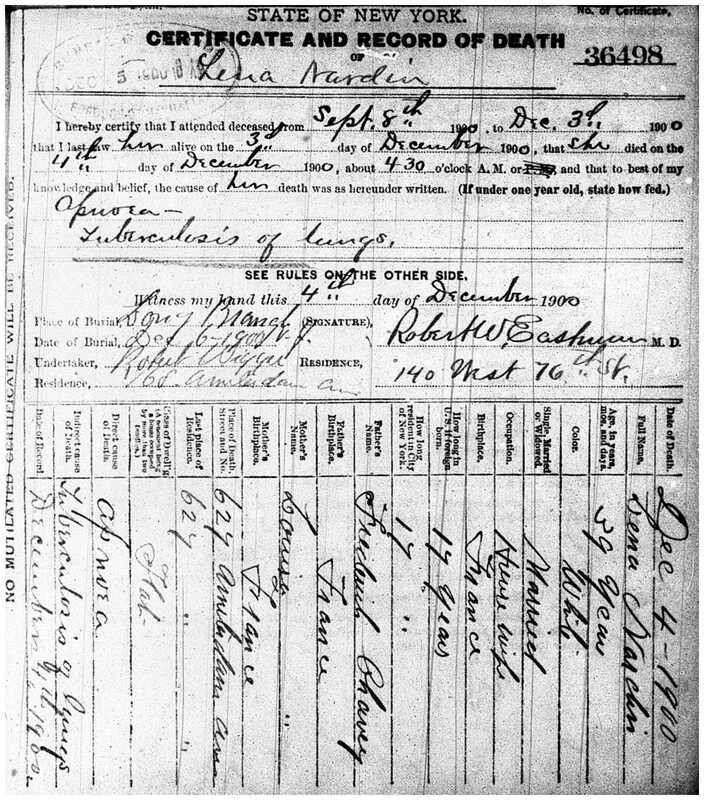 “New York, Marriages, 1686-1980,” , FamilySearch (https://familysearch.org/ark:/61903/1:1:F6QW-TVL : accessed 8 August 2015), Emile Nardin and Lillian Kornfeld, 04 May 1902; citing reference ; FHL microfilm 1,570,816. Emil was born in France, the son of Fredric and Susanne Nardin, and had arrived in the US in about 1886 when he was about twenty years old. He had been married previously to Lena Chavey, also French born, and they had had three children together: Ida, born in 1888, whom I cannot find on any subsequent record, Henri Arthur, who was born in 1892 and who died in 1895 from scarlet fever, and Helen Edith (known as Edith), born in 1896. On the 1900 census, Emil and Lena were living with just Edith. 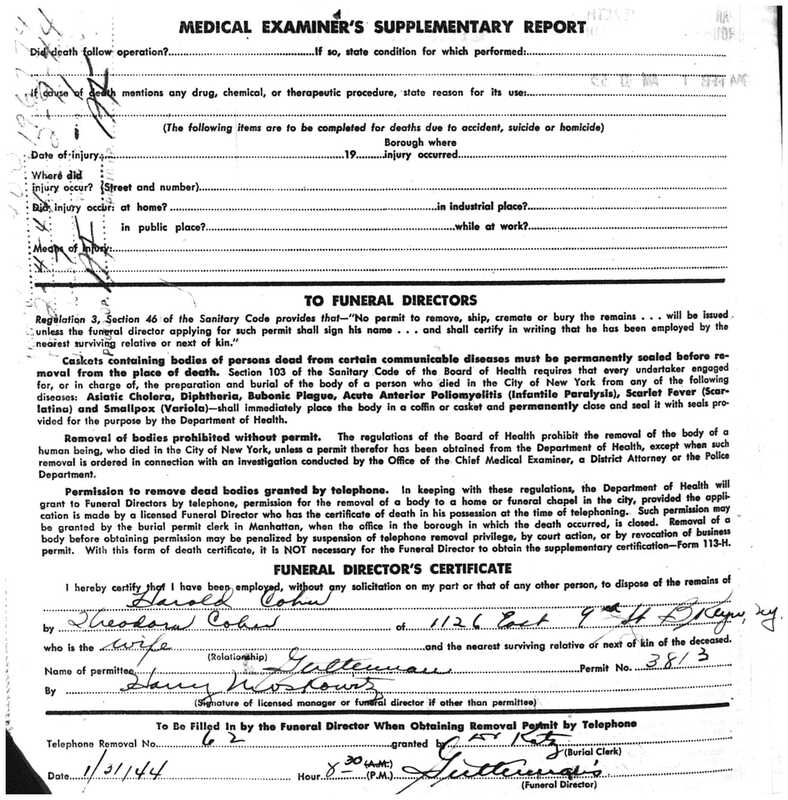 The census record reported that although Lena had had three children, only one was alive, so Ida must have died also. Emil was working as a cook. (A French chef in the family!) The family was living at 627 Amsterdam Avenue in New York. Sadly, Emil’s first wife Lena died from tuberculosis on December 4, 1900, leaving him with four year old Edith. Lena was 39 years old. Thus, Emil had lost two young children and his wife before marrying Lillian Kornfeld in 1902. Lillian and Emil had a child of their own, a son named Arthur, born on June 26, 1903. Mary and Oscar Kornfeld had two other grandchildren born in the early years of the 20th century. 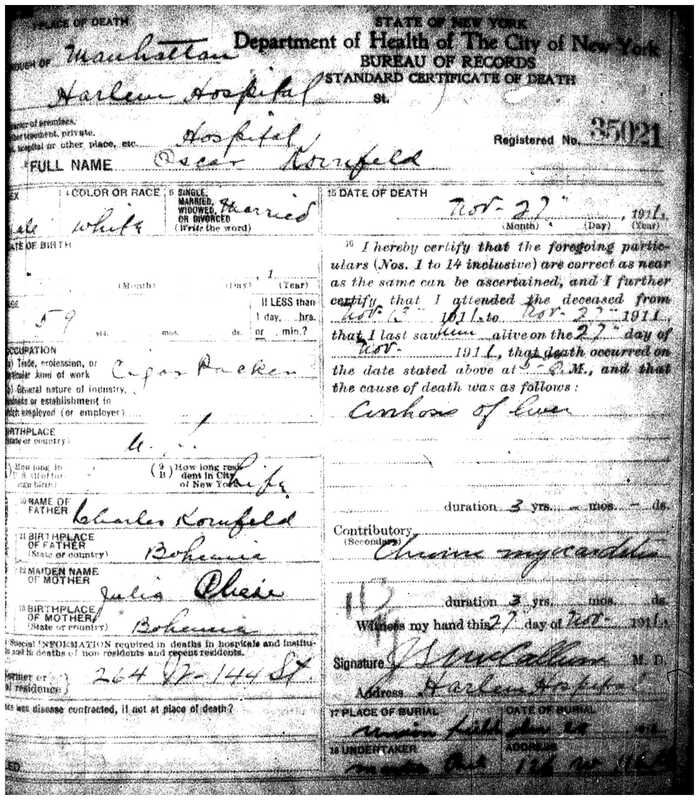 Carrie and Berthold Weiss had a daughter, Edna Hazel, on February 27, 1903. Rose and Joseph Cohn had a son Harold, born on January 18, 1905. Arthur Nardin, Edith Weiss, and Harold Cohn were the only grandchildren Mary and Oscar would have. Overall, these should have been happy years for the extended Kornfeld family. Unfortunately, Max Kornfeld soon ran into serious legal problems. In 1903, he was convicted on several counts of insurance fraud and sentenced to Sing Sing prison in Ossining, New York. As reported in the November 20, 1903, edition of The Standard, an insurance industry trade publication, Max Kornfeld was a public fire insurance adjuster and had been convicted of making a false insurance claim for $2000, claiming that his wife Emma’s wardrobe had been destroyed in a fire at the Hotel Richelieu. A later article dated December 10, 1903, in The Spectator, another trade publication, reported that Max was in fact part of a much larger insurance fraud scheme. It reported that Max had confessed to over 300 fraudulent fire insurance claims. He had testified that in these claims the adjuster received 40% of the proceeds, and he described some of the methods used to make these claims. 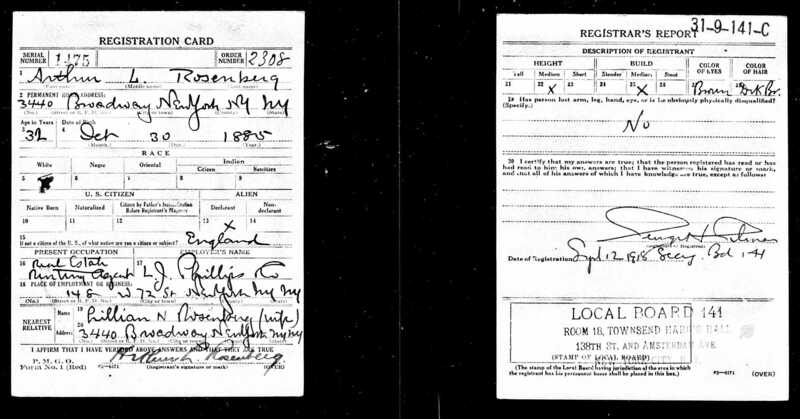 Max was admitted to Sing Sing prison on July 17, 1904, and according to the admission record below, it looks like he was sentenced for three to nine years; he was still in prison at the time of the 1905 New York State census. One thing I found interesting on the Sing Sing admission record is the recording of his religion as Protestant and Hebrew. There is also a detailed physical description; Max had a number of scars on his head as well as on his hand. 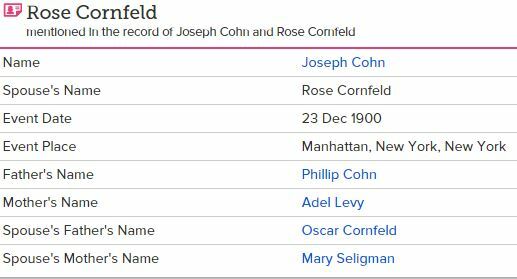 As for the rest of the family in 1905, I could only find Mary and Oscar Kornfeld and their daughter Rose on the 1905 NY census. In 1905, Mary (nee Seligman) and Oscar Kornfeld were living as lodgers without any of their children in the household of a woman named Anna Bohl, residing at 274-276 West 19th Street in Manhattan. Oscar was still working as a cigar maker. According to the 1905 NY census, their daughter Rose, her husband Joseph Cohn, and their son Harold were living at 10 West 118th Street, and Joseph was working as a printer. 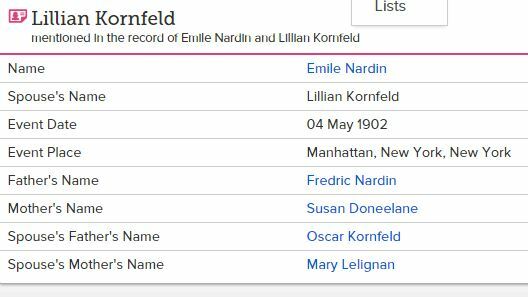 Although I could not find Carrie Kornfeld Weiss or Lillian Kornfeld Nardin on the 1905 NY census, I had better luck locating all the Kornfelds but Mary and Oscar on the 1910 census. Max was out of prison, and he and Emma had moved to Philadelphia, where Max was working as a real estate broker. They did not have any children. Rose and Joseph Cohn were living on West 148th Street with their six year old son Harold, and Joseph had his own printing business. Carrie and Berthold Weiss were living on Lenox Avenue with their seven year old daughter Edna, and Bert was still a hosiery salesman. Lillian and Emil Nardin were living on West 17th Street with their six year old son Arthur and Emil’s daughter Edith, who was now fourteen; Emil was a chef in a hotel. Thus, it appeared that all four of the Kornfeld children were doing fairly well in 1910. The next five years were harder. Their father Oscar died on November 27, 1911; he was 58 years old. He died from cirrhosis of the liver. Then Lillian’s husband Emil died on March 28, 1914, also from cirrhosis of the liver as well as a uremic coma; he was only 48 years old and left not only Lillian, but his daughter Edith, who was only 18, and his son Arthur, who was only ten years old. Poor Edith Nardin had lost her mother Lena in 1900 and now her father in 1911. By 1915 she was married to Arthur Downing Holmes, and the couple was living with Edith’s stepmother, Lillian Kornfeld Nardin, and Edith’s half-brother, Arthur Nardin, on West 92nd Street. Arthur Holmes was 25 and working as a real estate agent. He had been born in New Haven, Connecticut, and was a graduate of Yale. Meanwhile, eighteen months after Emil’s death, his wife Lillian Kornfeld Nardin remarried. On September 27, 1915, she married Arthur Rosenberg. He was born in England in 1885 and had immigrated to the US in 1898 with his parents. In 1910, he had been a chauffeur for a private family. According to his 1918 World War I draft registration, he and Lillian were living at 3440 Broadway, and he was now a rental agent for L.J. Phillips, a real estate company. Carrie (nee Kornfeld) and Bert Weiss and their daughter Edna were living at 2400 Seventh Avenue in 1915. 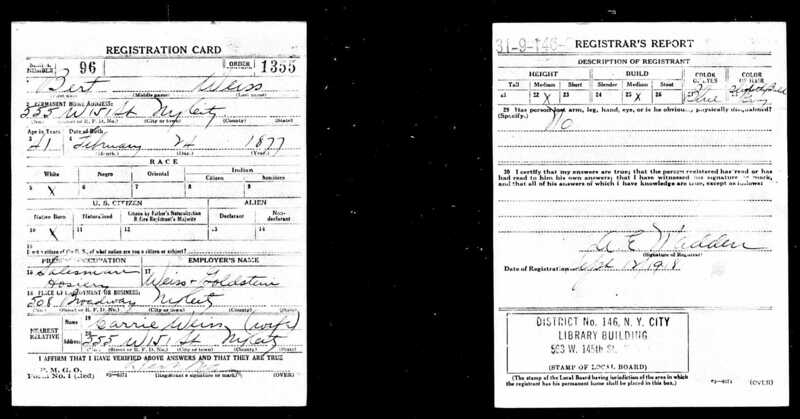 The 1915 NY census reports that Bert was working in the wholesale dental supplies business, but according to his draft registration for World War I three years later, he was back in hosiery sales in what appears to be his own business, Weiss and Goldstein. The family was then living at 555 West 115th Street. In 1920 Rose and Joseph Cohn were living at 253 West 146th Street, and Joseph had his own printing business. Their son Harold was now 15. 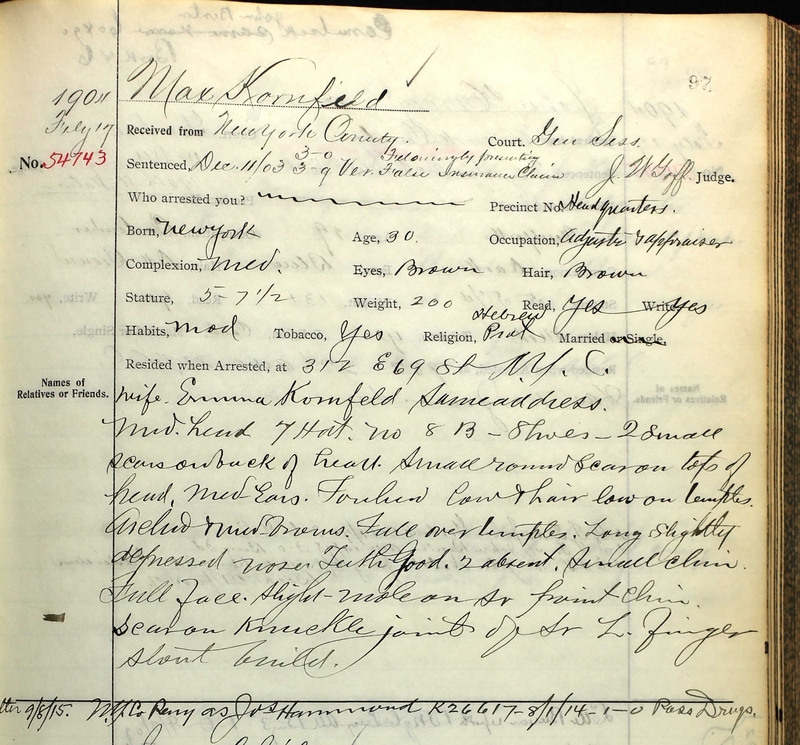 According to his World War I draft registration, Max Kornfeld and his wife Emma were living at 1628 Diamond Street in Philadelphia in 1918, and Max was self-employed as a merchandise man and insurance adjuster. I was surprised to see that he was back in the insurance business, given his criminal record for insurance fraud. In 1920, however, Max reported his occupation as a real estate adjuster. 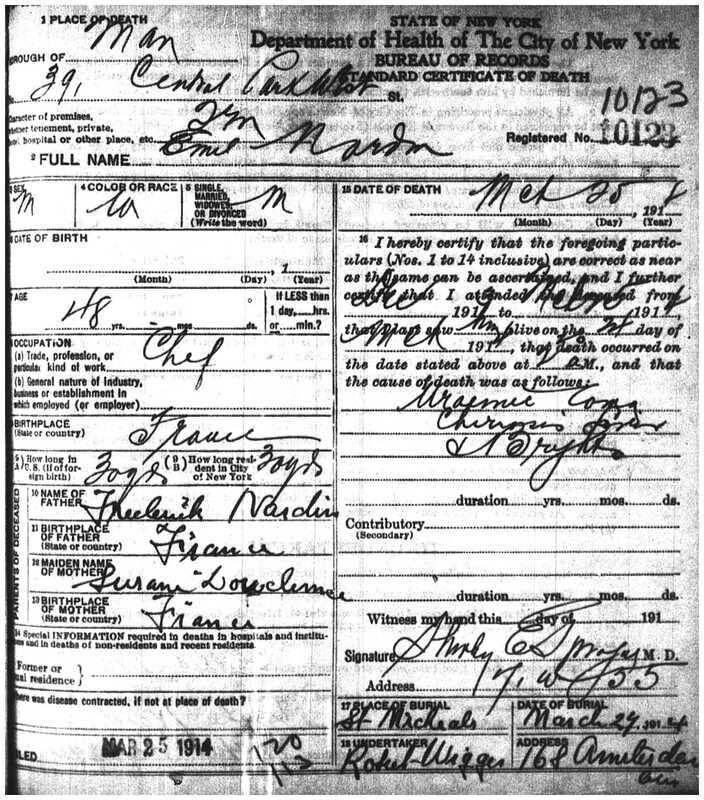 Mary Seligman Kornfeld must have moved in with her son Max and daughter-in-law Emma sometime after the 1920 census because when she died on January 13, 1921, her address was 1628 Diamond Street in Philadelphia, where Max and Emma had been living in 1920. Mary was 64 years old and had died from cardiac dilatation and pulmonary edema. 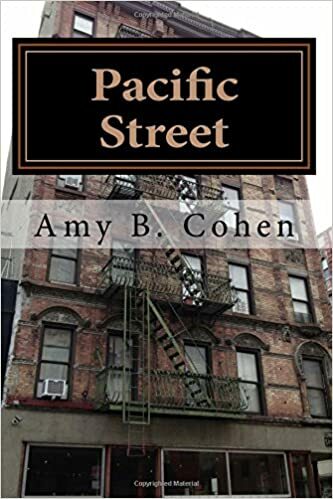 I thought it interesting that she had moved from New York where her three daughters and her grandchildren lived to live with her son in a city where she had never before lived. I also thought it odd that Max could not provide the name of his mother’s parents as the informant on her death certificate. Two years later Mary’s youngest child, Lillian Kornfeld Nardin Rosenberg, died at age 41. 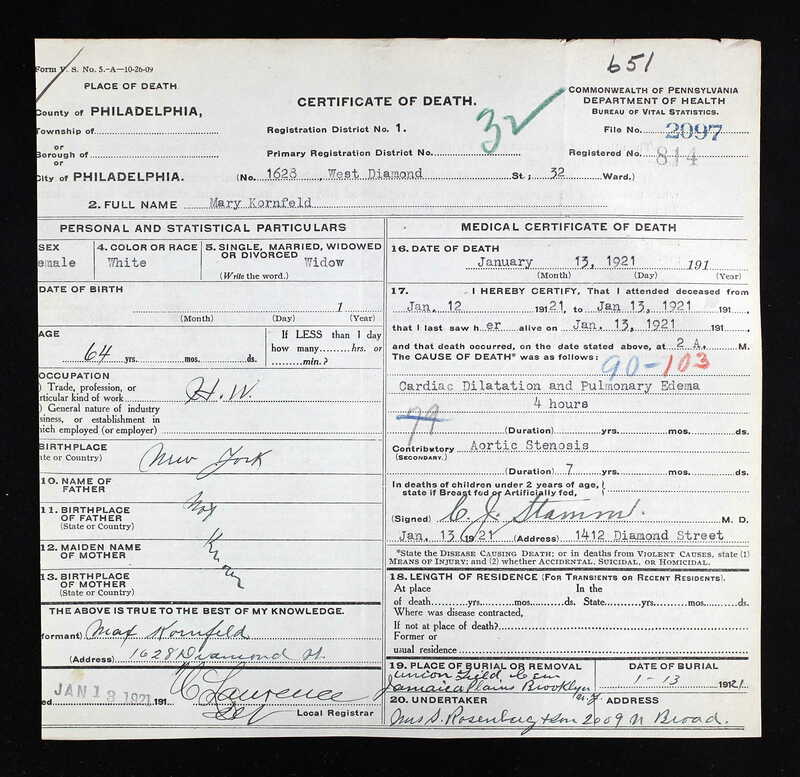 (Her death certificate says she was 39, born in 1884, but that is not consistent with the birth records from the NYC birth index I have for her.) She died from chronic endocarditis and cerebral edema. 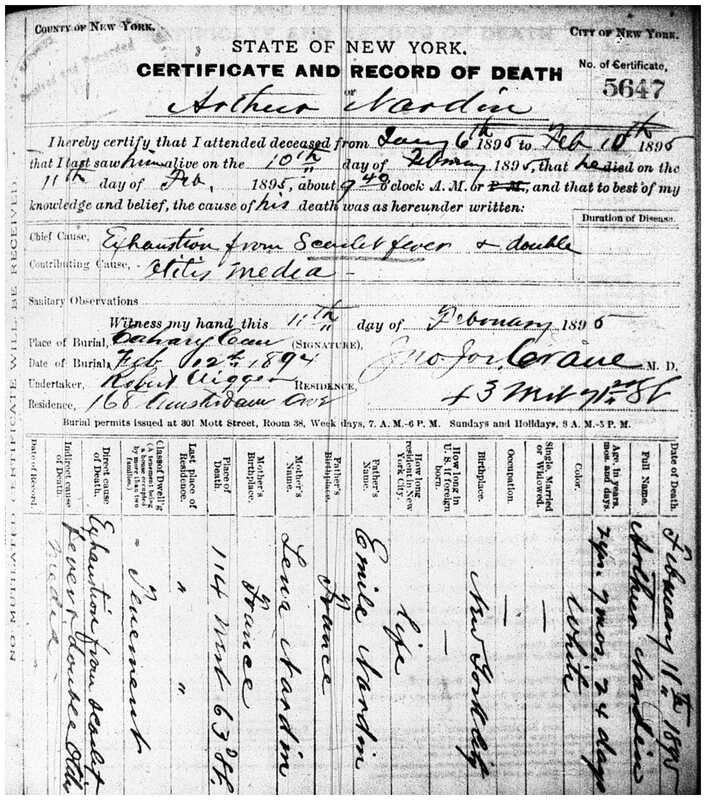 Lillian’s son Arthur Nardin was 20 years old when she died. On March 6, 1925, Arthur married Jane Burns; they were both 21 years old at the time. Their son Arthur Nardin, Jr., was born two years later. According to the 1930 census, Arthur, Sr., was a car salesman. The family was living on West 181st Street at that time. In 1930, Lillian’s sister Rose and her husband Joseph Cohn were living on West 90th Street, and Joseph was no longer a printer, but now an investor in securities. Their son Harold had married Tillie or Teddi or Theodora Kremenko, a Russian immigrant, on October 6, 1928. Thus far, I cannot locate Harold or Tillie on the 1930 or 1940 census, but did find that Harold died on January 31, 1944. He was only 39 years old and died from coronary thrombosis. I am now following a lead to someone who might be Harold and Tillie’s son, so I hope to get more information and some photographs. The third Kornfeld sister, Carrie, and her husband Bert Weiss were living on West 103rd Street in 1930, and Bert was still a dry goods salesman. 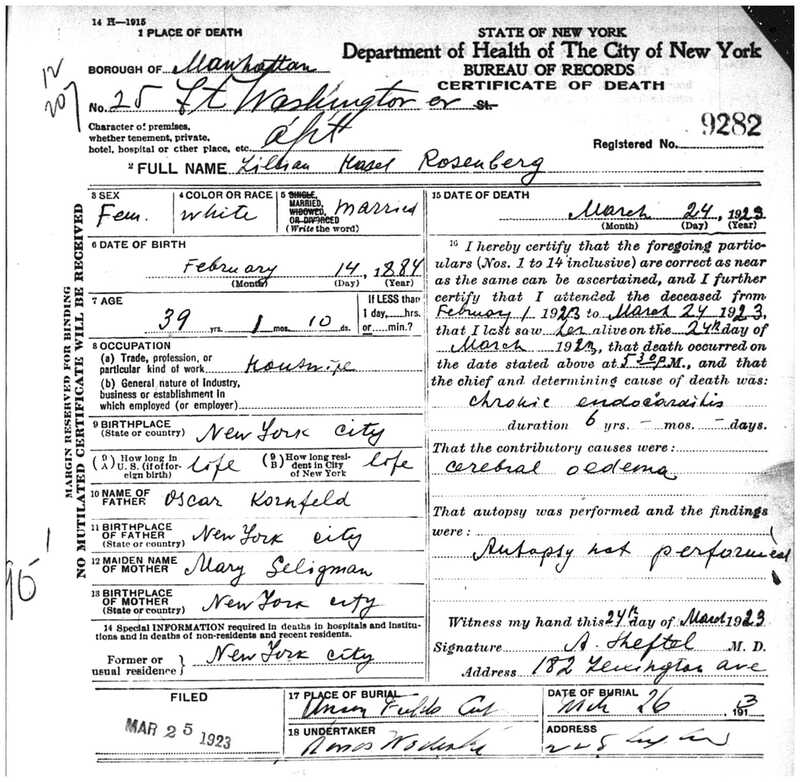 Their daughter Edna had married Harry Rosenberg on December 14, 1924. Harry was born in New York City, and in 1920 he and his father Edward were both selling dry goods. In 1925, Harry and Edna were living on West 176th Street, and Harry was selling real estate. Unfortunately, as with Harold and Tillie, I cannot find them on the 1930 or 1940 census. Finally, Max Kornfeld and his wife Emma had moved to Atlantic City by 1923, according to the directory for that year for that city. They were still there in 1926, and Max was working again as an insurance agent. I could not find Max and Emma on the 1930 census. (What is it with this family and the 1930 census? How did they elude the census takers? ), but they were still living in Atlantic City when Max died on October 25, 1931. Max was 57 years old. He was buried at Rodeph Shalom cemetery in Philadelphia. Thus, by 1931, two of the Kornfeld siblings had died, Max and Lillian. 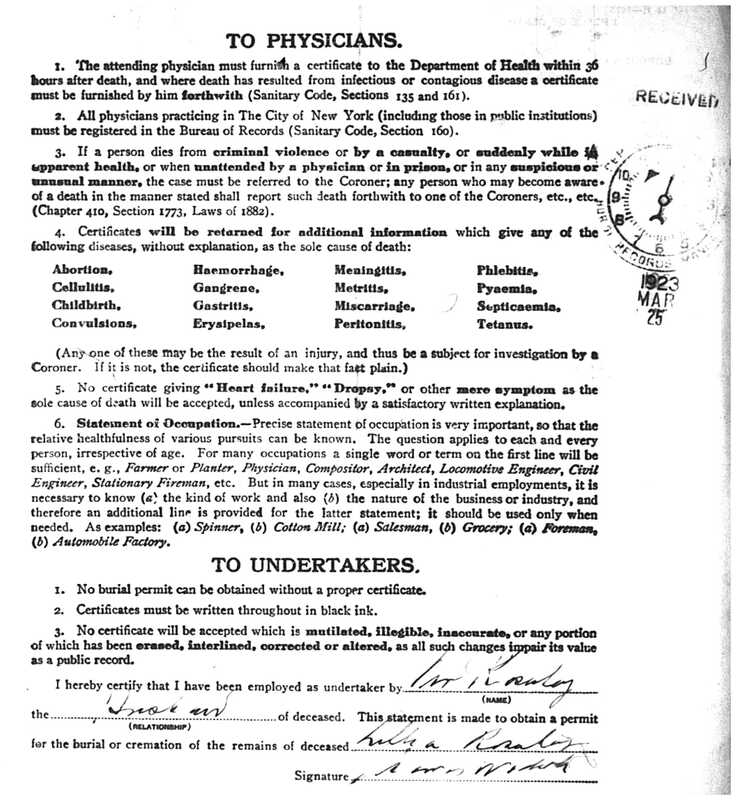 I cannot find Rose and her husband Joseph Cohn on the 1940 census, nor can I find their death records, and thus I do not know anything about them after 1930. The only Kornfeld sibling I located on the 1940 census was Carrie and her husband Bert Weiss. They were then living at 607 Broadway, and Bert was still selling hosiery. I do not have any information about them after 1940. As for the three grandchildren of Mary Seligman and Oscar Kornfeld, as noted above, I cannot find Carrie’s daughter Edna and her husband Harry Rosenberg on either the 1930 or 1940 census, nor can I find Rose’s son Harold and his wife Tillie on any census after their marriage in 1928. I only know that Harold died in 1944. The only grandchild about whom I could find any real information after 1930 was Arthur Nardin, the son of Lillian and her husband Emil Nardin. In 1940, Arthur and his wife Jane and his two children, Arthur, Jr. and Edith, were still living on West 181st Street, and Arthur was a car dealer. By 1958, Arthur and Jane had moved to Miami, where he died in 1983 at the age of 80. That brings me to the end of the line started by Marx Seligmann and his wife Sarah Koppel, who immigrated to the United States in 1849 shortly after Marx’s divorce from his first wife. Marx and Sarah must have come to the US to begin their lives together as a married couple in a new country, far away from their home country of Germany. From that marriage came four children, eighteen grandchildren, and fifteen known great-grandchildren as well as many great-great-grandchildren, all my previously unknown American-born Seligman cousins, including my wonderful cousin Steve who supplied me with so many family stories and photos. This entry was posted in New York, Seligman/Seligmann and tagged Kornfeld, New York City, seligman, sing sing prison by Amy. Bookmark the permalink. Wow, you have really documented this well. 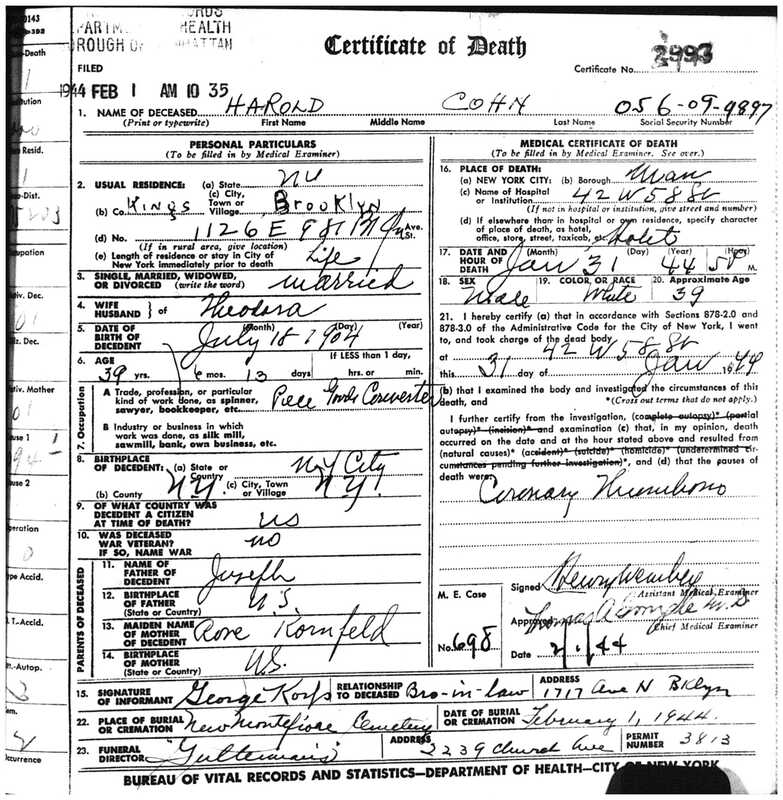 I’m always amazed when the parents are listed on the death certificate as “unknown”. Surely the deceased knew their names (or at least most of the time) but they must not have spoken of them to their spouse or children. How very sad. Thanks! Yes, I also found that a bit odd. Perhaps when the person is grieving, they just can’t think clearly? In my ancestor’s cases, they immigrated as young adults and left their parents in their home country. Obviously in those days you weren’t able to visit so chances of ever really speaking about them to anyone were much less than they are today. I came across your blog quite by accident. I am Jane and Arthur Nardin’s granddaughter. I knew that my great grandmother Lillian died young but I did not know that she was predeased by Emil. Jane Nardin died in 1987. My Uncle Arthur died in 2011 and my Mom Edith died in 2013. My father was Seymour Lehman and he died in 1990. My parents ma%ied and divorced twice. I have 2 bros. Thank you for shing a light on my family. It means so much to me. Hi, Jody! I believe we must be fourth cousins. I will send you an email. So glad you found the website and commented.